Amrita Singh is a company that makes extremely beautiful Indian jewelry. I did a review for this company and loved them so much that I asked to work with them again. I would highly recommend this company because the people are very nice to work with and the jewelry is great quality. The necklace that I reviewed a couple months ago is still in perfect condition and I wear it at least once a week. 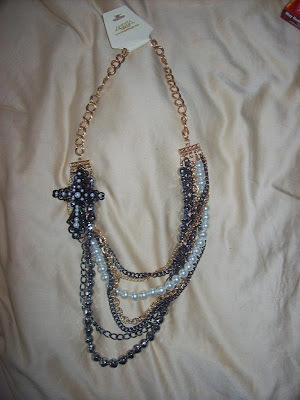 I chose to review the Magda necklace. It is beautiful and retails for $150. It is a multi strand necklace with a cross pendant. I think that this necklace could be worn to work, church, a party, a date, etc. It is heavy which I actually like in about a necklace. ***Right now, the company is offering free shipping and 30% off orders. Check out more information on their website. Thanks Amrita Singh for agreeing to work with me again!